We don’t have a crew of 20 guys running 10 trucks that can, “be there today” or are “in your area.” We’re usually booked out a couple of weeks. Why? Because we value our employees. In order to have a successful business, we have to take care of our customers, but that starts with taking care of our employees. I want to make sure my guys are working every day. I want to make sure they have enough hours in a week to feed their families and trust they will have a steady income. I don’t want to have high turnover and have to train new guys every year in my business philosophy or how to take care of our customers. If a truck is really “in your area” or can “be there tomorrow,” whose working that truck and what are they doing that they can just sit around waiting for you to call? Is that really someone you want working on your home? 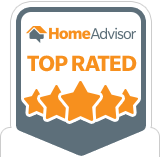 With us, you’ve got professionals with years of experience working on your home. It may take a couple of weeks to get to you, but like waiting in line for a great restaurant, it’s worth it.